Neck Pain and Headaches - Can Chiropractic Help? We have seen many patients over the years who report neck pain and headaches or migraine more than a few times per week. Many people believe nothing can be done about it, without ever considering the cause of their headaches! Don’t accept regular neck pain and headaches as part of normal everyday life – chiropractic treatment can help. Research has shown that some headaches and migraines are caused or aggravated by poor function of the neck, shoulders and upper back and can be accompanied by neck pain. Poor posture and poor work ergonomics can be contributory factors. If this is potentially the case for you, help is at hand. Dr. Ben Martin here in Optimal Chiropractic is highly qualified and experienced in the diagnosis, treatment and management of headache and migraine. Research also shows that spinal manipulation – the primary form of care provided by doctors of chiropractic – may be an effective treatment option for tension headaches and headaches that originate in the neck. • behaviours (insomnia, excessive exercise, blood sugar changes, etc.). About 5% of all headaches are warning signals caused by physical problems. Copyright © Neil Danton 2014. At Optimal Chiropractic in Ballincollig we can determine whether the root cause is related to poor function of your spine, poor posture or as a result of nerve irritation. With this knowledge your neck pain and headaches can be accurately treated and prevented from occurring again. We effectively correct and treat the underlying cause as opposed to just treating the symptoms. We ensure that you understand your condition more thoroughly and what your options are for the most successful treatment and management of your condition causing your neck pain, headaches or migraine. If you have tried everything and nothing seems to help we are currently running a promotion that will give us an opportunity to help you. 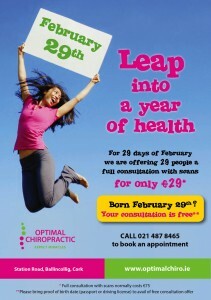 Call the office on 021 487 8465 to book your appointment or fill out the form below and we will contact you.